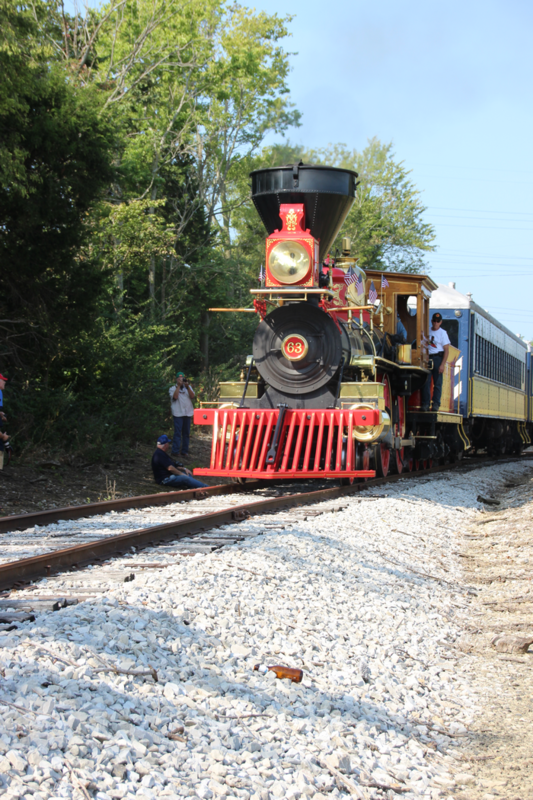 Over the 2015 Labor Day weekend, the Bluegrass Railroad Museum (BGRM) hosted the Leviathan steam locomotive. 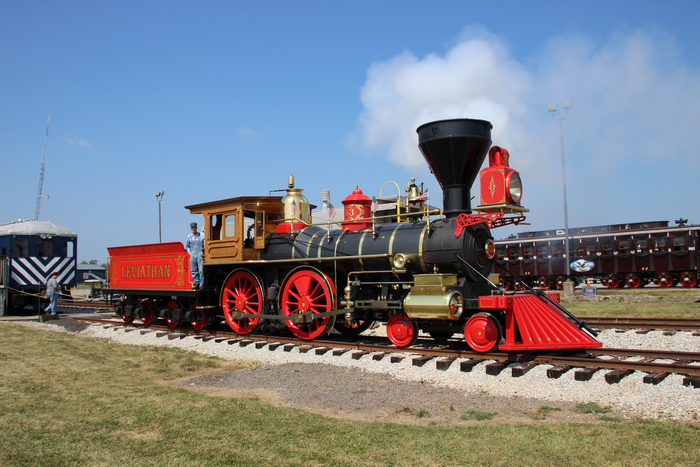 This locomotive is a replica of the steam locomotive that pulled President Abraham Lincoln’s funeral train. The locomotive was scheduled to make six runs at BGRM: five passenger runs, 2 PM and 4 PM on Saturday and Sunday; 2 PM on Monday; plus a photo charter run. The photo charter was to be on Monday at 9:00 AM. As soon as the listing was posted for lead conductors for these six runs, I signed up for both Sunday runs. The following conversation with myself lasted all of one second: “What should I do about the Labor Day photo run? I am “down” to work on that day at my normal job. Should I call into work that morning and tell them I am sick? I know I will be sick if I miss that photo charter. Which should I do? Should I ride the train as a railfan taking photos or as Conductor? Let’s see. I can shoot photos of trains any day of the week, but I can only be Conductor behind a steam locomotive pulling a photo charter but one time in my life.” I quickly signed up as lead conductor for the charter before anyone else could and made plans to call into work Monday to tell them I would be in late. The Sunday excursion train consisted of, from east to west, Leviathan; two open window coaches; two air conditioned coaches; and diesel locomotive N&W 675. N&W 675 would be used to pull the train west from the BGRM Depot, Mile 9, to Mile 6. At Mile 6, N&W 675 would cut off and Leviathan would take control of the train. She would pull the train to Mile 7 where the passengers would disembark from the train to witness a Civil War re-enactment skirmish. Once the re-enactment skirmish was over, there would be a run-by of Leviathan and her four coaches. After the run-by, the passengers would reload for the return to the BGRM Depot. Writing train orders for the two Sunday runs was challenging. I decided to write up both runs as one order and list Leviathan as my power. When I went to inspect my train, Leviathan was not attached to the consist but was parked some 100 feet to the east of the train for photo opportunities. Thus my set and release was done using N&W 675 as my locomotive. At 2 PM, I closed the gates on boarding passengers. Leviathan was now moved west to couple onto the train. Once her airline was cut in, line pressure dropped and I had to wait for the air pressure to rebuild before giving the Highball. With N&W 675 pulling, we headed west for Mile 6. At Mile 6, N&W 675 was cut off from the train. Once N&W 675 cut off, there was a two minute delay as airline pressure was brought back up. Once I had air pressure, we conducted a quick set and release to ensure that I had air pressure to work the brakes on the rear car of the train. With Leviathan now leading, we headed east for Mile 7. I went to the coach vestibule behind Leviathan to listen to her work. Why would you ride in an air conditioned car that required you to pay additional money over coach fare and be cut off from the sound of Leviathan working as she went down the track? At Mile 7, we stopped the train to allow our passengers to witness the re-enactors put on a mock Civil War skirmish. While the mock skirmish was going on, I had the Leviathan back west for .5 miles. Upon receiving word that the mock skirmish was over and a photo line formed, I gave Leviathan the Highball to run east at track speed. We may have gotten to running a little faster than track speed, but the sound of Leviathan working, coupled with the blowing of her whistle and the ringing of her bell, gave me goose bumps. Once clear of the photo line, we slowed and stopped. I then had Leviathan back up to reload our passengers. I quickly learned that unlike diesel locomotives, which when you call “Stop” they stop, with Leviathan I had to call “Stop” at least six feet from my stopping spot. Once reloaded, we ran east for the Depot for passenger unloading. As we entered the Yard, N&W 675, which had been following us, made a soft coupling to the consist. I would use N&W 675 to spot the consist at the platform. Once I unloaded my passengers, Leviathan was uncoupled from the train and pulled forward 100 feet so she was available for photo opportunities. Since I broke my consist upon returning to the station, I had to do another set and release before heading out for the 4 PM run. Upon returning to the Depot at the end of the 4 PM run, Leviathan had to be uncoupled from the train and then spotted to refill her water tank. This was accomplished using a nearby water hydrant. I need to mention that during the two Sunday runs Mary Ann was my First Class car host and Grayson was my ticket puncher. Calling in sick to work Monday, Mary Ann and I went to BGRM for the photo run-by charter. Our train consisted of Leviathan and the two coaches. I had all my paperwork finished, the Monkey Tail connected, and the set and release conducted by 8:15 AM so as to be ready for the 9 AM pull. Since all were on board by 8:45 AM, I gave Leviathan the Highball, and we headed west for the trestle at Mile 4.7. It was fun standing in the open doorway of the coach and calling switches, crossings, and slow orders to Leviathan’s engineer. I should note we at all times had one of our engineers in Leviathan’s cab, and one even got some time in Leviathan’s engineer seat. Upon unloading our photographers at Trestle 4.7, we spotted Leviathan in the center of the trestle. 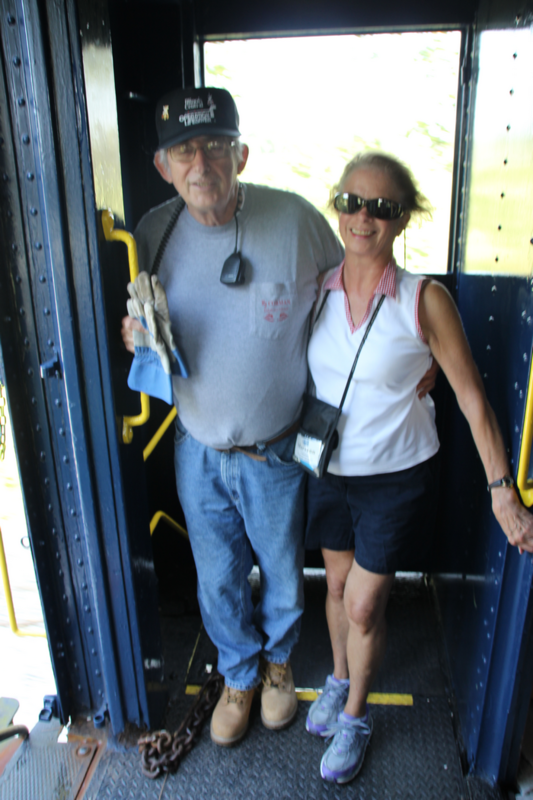 Apparently word had gotten out about our photo charter as a number of railfans showed up to chase us in their cars. Once everyone had taken all the photos he/she wanted at Trestle 4.7, it was on to trestle 5.5. 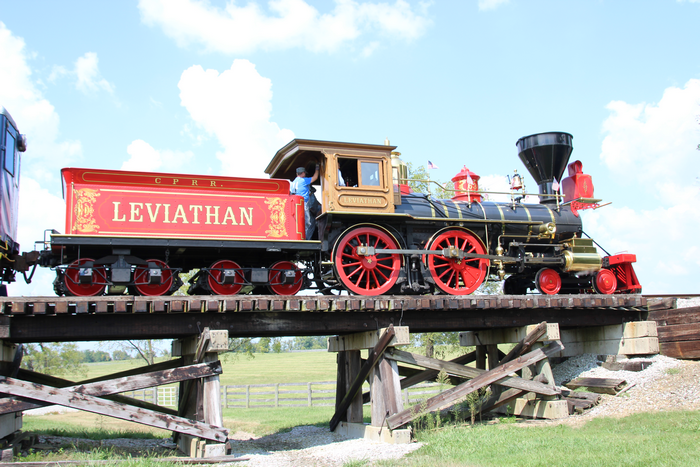 Here again, we posed Leviathan on the trestle, but once the still photo session ended, I took her a .25 mile down the track and we did a photo runby at Trestle 4.7. Next, it was on to the west side of Milner where Leviathan was positioned for photographs. Then I got to again back Leviathan west for .25 mile before giving the Highball to head east. I need to mention that while I was at the rear of the train during the backup, the Highball was not given until I was in the vestibule behind Leviathan. We rolled through Millner stopping short of Steel Road. Our photographers were scattered for over a .25 mile distance behind the train as each had sought the perfect spot to capture the run-by. We now headed east for Mile 7, the site of the Civil War mock battle. Here Leviathan was posed at various spots for the delight of the photographers. Then I got to back up Leviathan one more time for a photo run-by. Leviathan’s cab held three people; however, the two coaches had but one person, me. As we were running out of time and had to be back at the Depot by noon so Leviathan’s crew could eat, I made sure we did a long west back-up before giving the Highball to head east. During this run, I had my head stuck out the near vestibule window to catch the full sound of Leviathan working as she ran east. All too soon the runby was over, and it was back to pick up the photographers. Did I mention Mary Ann was one of the photographers? Due to the need to be back to the Depot by noon, the run-by at Mile 7.5 was cancelled. Never did 3 hours go so fast. After tying the train up at the Depot, I sadly departed my train to close out my paper work and turn her over to the afternoon lead Conductor. While I was sad that my time as Conductor behind Leviathan was over, I was, at the same time, experiencing a high that I had never experienced before in carrying out the job duties of Engineer or Conductor. If I ever get another chance to serve as Leviathan’s Conductor, I will not hesitate for one second before putting my name next to a run. The well-dressed Conductor and his wife.